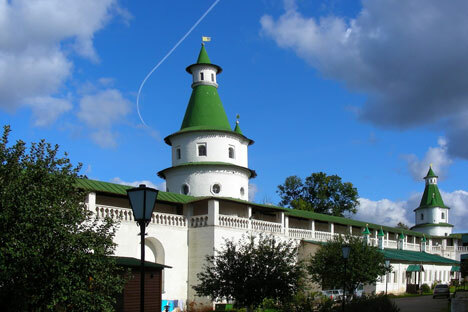 An easy but memorable day trip from Moscow is to take the train to the “Russian Palestine” and stroll through the “garden of Gethsemane.” Several interesting museums and churches are gathered inside the whitewashed walls of the New Jerusalem monastery at Istra. The famous mid-17th century Patriarch Nikon chose a picturesque loop in the Istra River, 60 km west of Moscow, to build his “New Jerusalem,” renaming the park beyond the walls “Gethsemane” and the river “Jordan.” Today, the town of Istra itself is mostly unappealing and industrial, but the monastery has been slowly restored following a destructive German occupation. Inside the gates, the incredible Resurrection Cathedral rises from a cluster of smaller chapels. The most striking features are the huge conical roof with tiers of windows to let in the light, and the decorative “peacock’s eye” tiles by Belorussian ceramicist Stepan Polubes. There are boards showing some of the monastery’s history and, beyond them, steps up onto the walls. The walls and the lovely gate church date from the late 17th century. The great “Three Saints” bell, hanging nearby, was cast in 1666 and waits for the eventual restoration of the belfry. The first door, nearest the gate church, leads to the underground church of Sts. Constantine and Helen. The baroque 18th century interior has been beautifully restored, and a little chapel in the far corner serves water from the holy well. The next door leads to Nikon’s tomb, in the John the Baptist chapel with a ceramic iconostasis. The patriarch was famous for his church reforms, which led to a schism in the Russian Orthodox Church and the formation of the group known as the “Old Believers.” Tsar Alexei (father of Peter the Great) later used this rift as an excuse to exile the patriarch, who was getting too powerful. On the far side of the cathedral, you will find an entrance into the Chapel of the Holy Sepulchre. The main cathedral is still not fully restored, although work has recently intensified and you can see fragments of the rich interior decoration through a screen, including frescoes and patches of beautiful royal blue paint. There is a pretty row of whitewashed buildings with little gardens on one side of the cathedral. A modest 17th century palace, built for the monastery’s great patron Tsarevna Tatiana Mikhailovna, is flanked by monastic cells. A combined ticket entitles you to glance around the temporary exhibitions in the Prior’s chambers. On the far side of the Nativity Church are the main museums and art galleries, housed in the old refectory palace and hospital buildings. These halls are worth visiting for the interior architecture and for the displays of monastic artefacts, Russian art and more. You can see an icon of Christ having his feet kissed by Patriarch Nikon and the Metropolitan of Moscow. The most memorable contemporary picture of Nikon shows him crowned and surrounded by adoring monks and clergy, who are holding his Bible, glasses and rosary beads. The unknown mid-17th century artist has created individual expressions, an almost unique portrayal in Russian art of the period. There are models and maps demonstrating how the landscape here was supposed to represent Palestine. Behind the refectory, a path leads through a gateway into the park. A track leads right across a ribbon-covered bridge, past the holy spring, to the hermitage where Nikon lived in the years before Alexei banished him to Volgograd. The patriarch built this decorated “skete” in 1658 and stayed here (in the little hut on the top floor) during a self-imposed period of exile when he was angry about Tsar Alexei’s restrictions of church power. He also built the artificial canals that once turned the area into a miniature island. The river behind the hermitage has steps so that pilgrims can swim in the holy “Jordan.” If you follow the water, you can make a loop around the “Garden of Gethsemane.” Along the way, you can see some of the wooden buildings that made up the late Soviet-era museum of ethnography here. They are rarely open these days, but there is a lovely view along the way of the winding river and its flowery banks, the windmill and the “Izba,” a wooden house transported from Vykhino, where it was once an inn. Just past a little wooden chapel is the red brick exhibition hall. Trains to Istra leave from Moscow’s Rizhsky Vokzal (Riga Station) roughly every half an hour and a return ticket costs about 250 rubles. After a pleasant hour-long journey through woods and dacha villages, it is easiest to take a taxi (100 rubles) from Istra station (although you can walk from here or from the slightly closer Novoierusalemskaya station). The monastery (“monastir”) is almost the only noteworthy local landmark, so there is little chance of confusion about where you want to go. A combined (“yediny”) ticket will entitle you to visit all the museums inside the walls and the exhibition hall/tearoom just beyond. Entry to the monastery itself and its churches is free. For an extra 30 rubles, you can get a ticket to walk around part of the monastery walls. There are also (pay) toilets here, just beyond the kassa.